Here's an idea that has picked up speed lately on Twitter. 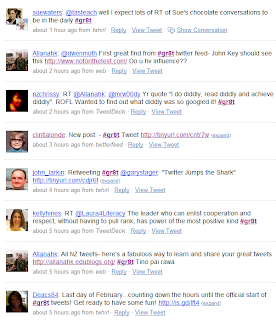 During the month of March use the hashmark (#gr8t) to retweet (RT) your favorite tweet of the day. Laura Deisley's post "What's tickled you lately?" Darren Kuropatwa's blog post "Great Tweets #gr8t"
Clint Lalonde's blog post "gr8t Tweet"
Allanah King's blog post "Tweet of the Day #gr8t"
Plenty of others, but those are a few who will explain it better than I. Follow the TweetBird on Twitter or seach Twitter for #gr8t tag. Maybe I should've titled this "Please share the Tweets of March"
... the tweets are coming, the tweets are coming.